This year the event took place at Landon Bay Centre, a Parks Canada park situated on 1000 Islands Parkway near Rockport Ontario. The 'training wall' at Rockport - 69 feet of wall that was built (as part of three workshops) and taken down and rebuilt again by students being tested with the DSWA over three days of Rocktoberfest. John McLeod and his wife Marion pose in front of the arch entranceway to the 'lookout trail' which was recently constructed during the 2010 DSWAC Rocktoberfest event near Rockport, Ontario in October. The Rocktoberfest Arch was one of the projects that several guest wallers worked on over four days last Thanksgiving. It serves as an entrance gate to several of the hiking trails in Landon Bay Park. The material used in this arch and the test walls and the bridge came from the historic Barbara Heck house which was taken down and all the stones stored at the park for many years. Our annual Rocktoberfest children's event involved a fun project teaching the basics of good structural placement, utilizing two full bush cords of softwood we had delivered to the park. Volunteers, students, and professional wallers help remove the centering from the newly constructed bridge at Landon Bay Centre near Rockport, Ontario. Aaaron Wallis and his family inspect the underside of Kay'Bridge which he (and one of his sons) helped build during the four days of Rocktoberfest, along with other members of the DSWAC. The dry stone foot bridge was completed in 5 days by volunteer wallers from all over Canada, The United States, Ireland and Britain. Thanks to everyone who worked on it including Patrick McAfee, Michael Weitzner,Norman Haddow,Evan Oxland,Joe Mitchell,Akira Inman,Karl Kaufmann,Angus Evan,Charlie MacMartin,Eric Landman,Matt Jones,Aaron Wallis,Christopher Barclay,Andre Lemieux, Steve Hodges, Dave Cudworth,Menno Braam,Phil Meany, Rob Miller,Jordan, Ryan, George,Laura,Dan and a special thanks to Gavin Rose and Scott Cluett. Norman Haddow insisted that the sixty nine feet of dry stone wall the students built last Thanksgiving Weekend at the Canadian Rocktoberfest walling workshop had to have vertical copes that were built well enough that they couldnt be pushed over or even wiggle if you tried to move them. In fact, he said, they had to be strong enough the someone should be able to walk along the top of the wall with a wheel barrow and not fall down or dislodge anything? DSWAC member Kurt Wegner took Norman at his word and proved that the students wall met the test. This lovely outdoor fireplace designed by John Scott was one of five dry laid projects built by wallers from all over Canada and the United States during our very successful Canadian Thanksgiving Weekend at Rockport, Ontario. Others who helped on the project were..
David Sprague, Perth, who cut the voussoirs and mantle corbels. John Scott wrote about the Rocktoberfest Campgound fireplace ... " It sort of designed itself. The dimensions were based on the stone available and the slate size etc... for example the slope was based on a 4' sandstone panel and the box size was based on a couple of throat lintels that we'd casted years ago. The firebox and the smoke chamber are three times thicker and better bonded than a conventional fireplace since they are dry fitted and bonded into the surrounding stonework.... and the whole thing was shaped as per the number of people working on it. We'd built until we reached a problem, then drank beer and listened to Bobby Watt sing, and found inspiration there. Also we totally snagged that mantle stone from Evan Oxland while he was in deep thought acing his DSWA test. (hey...where the hell did my through go????) (JS whistling with rolled eyes). It's interesting that all materials (except the slates), including the flashing at the roof cap, are recylced and were destined for the dump and the majority of the stone came from the site with the exception of some of the quoins piggy-backed en route to the jobsite. Even the sod had been thrown out. Hmm, in fact the slate was piggy-backed in the truck on an unrelated venture. Special thanks to John Scott (head of the heritage masonry program at Perth) for coming up with this design and rallying the team towards the completion of the project, which eventually evolved into this very cool structure, utilizing re-claimed, ecologically friendly, mostly non-manmade materials. Parks Canada now has a unique enclosed fireplace on site at Landon Bay Centre for campers to keep warm and gather around in the evening to sing campfire songs. Heritage masonry students from Algonquin College in Perth Ontario all joined in to help John build this amazing structure. Even though it wasn't quite completed when we lit a fire in it on Monday evening, it worked very well and provided much need warmth while we waited for Norman Haddow and Michael Weitzner to finish grading the seven participants being tested for their DSWA certification. Over sixty feet of beautiful dry stone wall was completed during the 3 two-day hands-on workshops taught by Michael Weitzner, Norman Haddow and Patrick McAfee at our recent Thanksgiving 'Rocktoberfest' event in Rockport Ontario. Thanks to all the students who did such a great job. Wallers Gavin Rose, Karl Kaufmann, Andre Lemieux, SteveHodges, Michael Weitzner, Patrick McAfee, Charlie MacMartin, Menno Braam and Phil Meany take a break from shaping and pre-fitting voussoirs during the second day of the dry stone Landon Bay bridge construction project at this year's DSWAC Rocktoberfest near Rockport Ontario. -Dry stone fireplace construction with John Scott - traditional masonary instructor at Algonquin -College in Perth. -Arch trail entranceway creation with Evan Oxland. -Music throughout the four days by Bobby Watt, the Ancient Music Trio and Joe Callahan and many other local musicialns. -Lectures and Presentations in Rockport on Saturday and Sunday Night. -Seven participants being tested for their intermediate and beginners DSWA certification. Professional and amateur wallers alike, along with many supporters of the craft, come together from all over the world and participate in demonstrating and promoting the art of dry stone walling. We do this not just because building dry stone walls is so engaging, but also to take the opportunity to enjoy one another's company again and to catch up each year with all that has been happening in the world of 'Walls Without Mortar'. 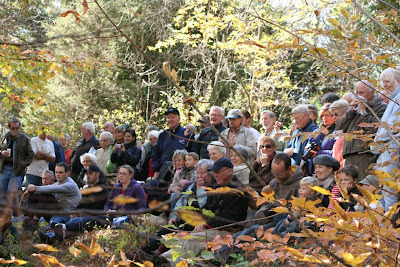 Last year, we had nearly 800 people come to our Dry Stone Wall Festival in Grand Valley Ontario. There were children's activities, guest speakers, presentations, tool displays, great food, music, workshops and a 3 day demonstration involving wallers from all over the world building together. This year we did it again in Rockport Ontario at Landon Bay Centre. While attendance is free and visitors were welcome to come and watch, this is mostly about participation. Members of the DSWAC built 'Kay's Dry Stone Footbridge' over this small creek along a footpath in Landon Bay Park as well as completing four other challenging dry laid projects, including a fireplace and an arch entranceway. Thanks to the many many people who made this year's Thanksgiving Weekend event such a great success. Special thanks to all the wallers who came to participate from as far away as British Columbia, Scotland Ireland England, Vermont, New Hampshire, New York Georgia, Newfoundland and Quebec. The 7th Annual Canadian Dry Stone Wall Festival was held this year in the beautiful Landon Bay Centre, a 225 acre ecological reserve, and beautiful park area, run by Parks Canada, which is situated near 1000 islands. It has hiking trails camping, swimming, and many more facilities. Our festival involved the construction of Kay's Bridge a permanent dry stone 'arched footbridge' (12 foot span) in the Landon Bay Park property in memory of Kay Donevan. It is built over a year-round brook to connect a well-used hiking trail in the park. It was built during the four days of the festival (without using concrete or cement) by a volunteer team of international wallers. Several hundred people attend all four day festival and watched the building of this bridge from several key vantage observation areas. -Dry stone wall workshops and testing, Saturday Oct. 9 and Sunday Oct.10. -Indoor presentations during the evenings given by guest stonemasons from Great Britain. -A guided walk of unique geological features of this unique Biosphere Reserve. While students and those being tested needed to register and pay a small fee, admission to the actual festival was, as always, free to the public. This year at Rocktoberfest, as in other years, the DSWAC facilitated certified dry stone wall testing during the month of October. Beginner and intermediate level wallers were tested. Proceeds from our yearly Thanksgiving Dry Stone Wall Festival go towards paying for qualified testers to come each year from Britain and the United States to examine students to the standards set out in the British Craftsman Certification Scheme. John S-R and daughter Maddy at the arch entrance way to the Landon Bay Centre Hiking trail. The DSWAC would like to thank everyone who made this year's festival 'rock'! Landon Bridge didn't fall down after we pulled the form out. The new outdoor fireplace was beautiful and it really sucked! 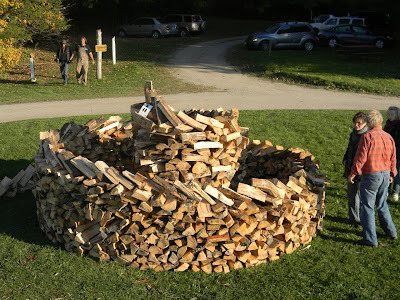 The children's spiral woodpile didn't fall on any kids. The gothic arch was inspiring. The sixty nine feet of dry stone wall that got built by all 24 students on day 2 and 3 was then taken down and rebuilt once more on day 4 by those amazing people being tested. The musician's tone-work complimented and augmented all stonework that was being done. The meals were on time, and yummy, and kept us going. The weather, like a wall without mortar, was 'dry' The hospitality spectacular. The presentations opened up our eyes to new possibilities and old traditions. The testing upheld valuable standards. The level of cooperation was awesome while the friendship amongst all those at the festival who work in this traditional craft was genuinely unsinkable. Thanks again, everyone.